NEWTOWN, Conn. -- President Barack Obama will reflect on his visit to Newtown after the 2012 shooting at Sandy Hook Elementary School during the final one-on-one television interview of his presidency. "I still consider the day I traveled up to Newtown to meet with parents as the toughest day of my presidency," Obama said in a preview for the special, which will air on Sunday, Jan. 15. "It's the only time I ever saw Secret Service cry." Two days after the Dec. 14, 2012 shooting that left 26 people dead, including 20 children, Obama visited Newtown and met with families of the victims as well as first responders. He also spoke at an interfaith service that drew more than 1,000 people to Newtown High School. When he addressed the crowd, he spoke about how the Newtown community inspired the country through the bravery and love they showed after the tragedy. He also touched upon political issues such as gun control and school safety, debates that continue more than four years after the shooting. He closed by reading the names of the children and teachers who died. "I come to offer the love and prayers of a nation," Obama said. "Mere words cannot match the depths of your sorrow nor can they heal your wounded hearts." Last year when Obama introduced a series of executive orders designed to help reduce gun violence, he was introduced by Mark Barden , whose 7-year-old son Daniel was among those killed in the Sandy Hook shooting. Obama wiped away tears as he reflected on meeting the families in Newtown. "That changed me, that day. And my hope earnestly has been that it would change the country," he said. "Every time I think about those kids, it gets me mad." 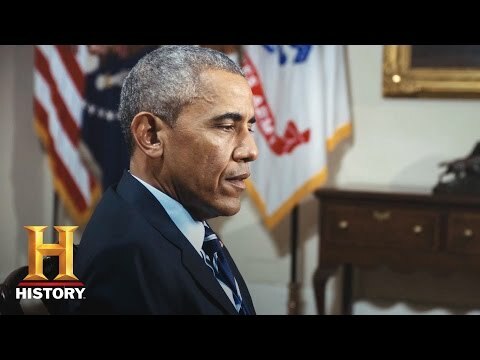 The two-hour special, "The 44th President: In His Own Words" is the final one-on-one television interview of Obama's presidency. It is comprised of interview footage shot both before and after the 2016 Presidential Election. The special will premiere Sunday, Jan. 15, at 9 p.m. on the History Channel.